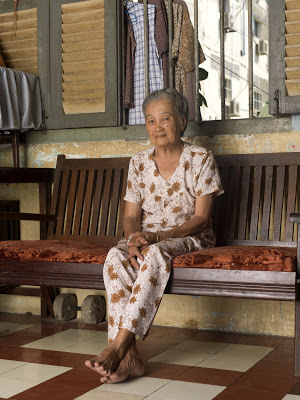 Our Vietnamese neighbor has been living in Cambodia since 1981. Her husband lives here too, some streets away. Together they got 11 children, 4 of whom passed away already. Her house is literally stuff-ed: a sowing machine, dusted chairs, a whole miniature house, with photos and incense for her forefathers. During the day she sits on her her balcony watching the street, and she helps take care for the baby of her neighbor.